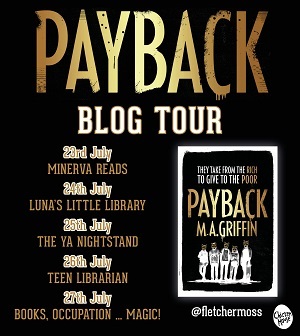 Over a week ago, I featured Payback as my book of the week. It’s sharp, political and a very modern take on Robin Hood. Here, MA Griffin describes the influences and ideas that formed the novel. Every generation has their own version of Robin Hood. Mine was a BBC adaptation starring first Michael Praed and then Jason Connery. Like all versions, it differentiated itself from its predecessors with a series of idiosyncrasies. This one had a moody Clannad soundtrack over shots of shadowy forests, and a weird stag-headed God called Herne the Hunter. Two elements of the Robin Hood story have stayed with me ever since. One is the fascination with ensemble casts. The line that runs through Poison Boy, Lifers and now Payback is the assembly of a rag-tag crew of unlikely heroes who spend as much time battling each other as they do the forces of the antagonist. 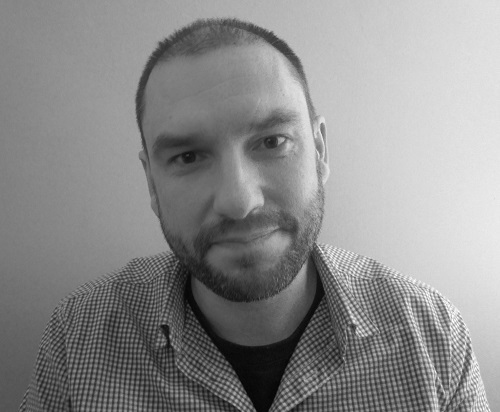 The other is the idea of the sympathetic outlaw – the character whose actions are morally dubious but whose intentions are good, and who finds themselves battling a hierarchical system built to favour those in power. As I planned and wrote Payback, I was thinking partly about the Amazon tax scandal of 2016, now being replicated blow-for-blow by Netflix. I was also thinking about an article I’d read about champagne in the House of Lords. As austerity bit, there was a plan to combine the catering services for the House of Commons and the Lords to save the taxpayer money. The Lords rejected it because it would have meant accepting a cheaper vintage of champagne. Their catering budget is £1.3m per annum. Parliament’s bar bill in 2016 was £1.8m. Combined, that’s £12.4m over the course of a four year term that we’re not spending on mental health services, housing, welfare, the NHS, education. 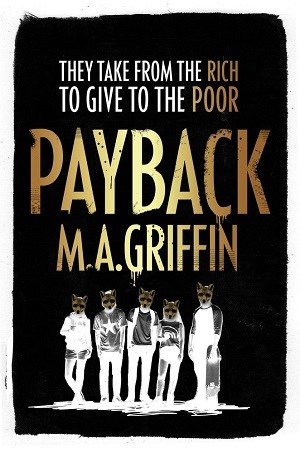 Payback is a masked gang of teenagers who are way too brave and enterprising to accept this sort of nonsense. They plan heists (‘grabs’) stealing money and valuables from corrupt lawyers, luxury goods companies and unscrupulous casinos then arrange ‘drops’, public events where the money is redistributed amongst those less fortunate. They have a YouTube channel of movies shot during their raids. They have fan-forums where supporters share potential targets. City centres bristle with pro-Payback graffiti; newspaper op-eds speculate about the identity of the gang’s masked members. When our protagonist Tom gets to join his idols, he’s thrust instantly into the limelight; famous overnight. But Payback is struggling. Evading the law month after month is exhausting and one particularly relentless cop is closing in. Then it turns out they’ve made a terrible error. The victim of one of their heists turns out to be vengeful and unhinged; a man ready to do anything to protect his reputation.